Our LPG stoves are energy saving, having high thermal efficiency of minimum 68% and are manufactured as per IS:4246. As per studies the High thermal efficient LPG stoves save LPG . 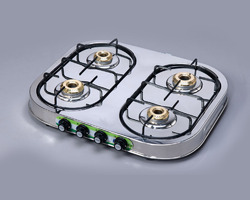 Being a well-established organization, we are presenting a wide range of Burner Glass Gas Stove. At the vendors' base, this is manufactured by using ultra-modern technology and utmost grade material as per set industry norms. This is quality checked on various quality parameters by quality controllers before final dispatch.